Is it worth upgrading the dcdc charger on the Scout? Re: Is it worth upgrading the dcdc charger on the Scout? A 40A charger would be overkill for a single AGM battery. As a general rule the maximum charge rate seems to be 25% of the battery capacity. This depends on the battery type and rating etc but OK as an average. So with a single 105Ah AGM battery the standard 25A charger would be fine. If dual 105Ah batteries then the Redarc 40A would be good. If Lithium then I believe they can accept a higher charge rate so probably good for them whether one or two batteries. Whether it's worth the money to upgrade is probably down to your travelling style. If you tend to do short stays and a lot of driving then the charge rate isn't so important. If you stay longer and drive less then getting the faster charge into the battery would be helpful. That's the rational I used when I put the Redarc 40A dcdc into the previous camper anyway. With the new Tvan the fact that it has the fixed solar panel to add extra charging when you are stopped for lunch etc may change the game a bit. For me, more power is always better. Less stuff to worry about. Hence I splashed out on the dual lithiums and the Redarc 40A charger. 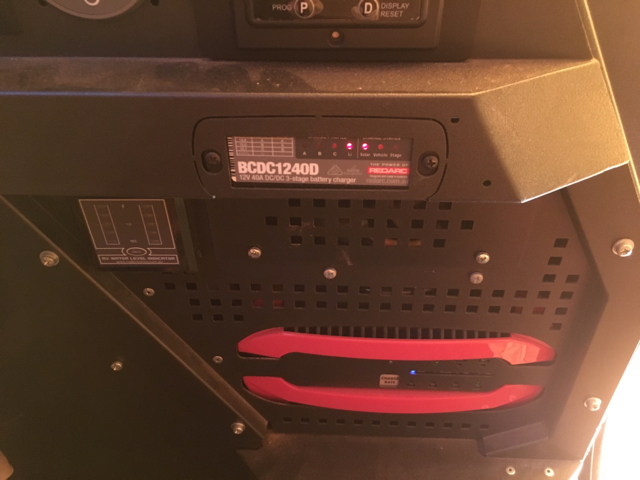 If you go with the 40A dcdc make sure the car cabling and fuse are up to it. Due to losses etc the current from the car can get up to around 50A. I used 6B&S sized cabling from the car battery to the Anderson plug and that seems to be fine. I originally used a 50A auto reset fuse at the battery end to protect it and it started buzzing when initially charging a depleted battery so it was probably exceeding its rating. I have since changed the fusing to something like this https://www.whitworths.com.au/blue-sea-single-stud-terminal-fuse-block . It bolts directly onto the battery terminal. We have 2 agm batteries at the moment, would love lithium but can't fit them in the budget will wait for them to come down in price. Congratulations, how much does it weigh? Ended up at 1200Kg tare which I am very happy with considering the amount of fruit added. The Murranji is already quite fruity however we added a bit more. We went with the 1.8T upgrade to make sure I had plenty of latitude in case we needed to load up for extended remote trips. Front water tank added for similar reasons. Pantry drawer added however storage box slide removed so fairly neutral in weight. Same with the Lithium batteries. Two lithiums are around the same weight as one AGM. Extra canvas (annexe roof, end walls, draught skirt etc adds a bit more. I know this tends to go against the minimalist approach however it should hopefully suit us for quite a while to come. The Projecta IDC25 is a very good charger, and in my opinion its the pick of the bunch (with the exception of the Manager 30). I've got two purchased last year - one under the bonnet of the 200series charging a 105Ah AGM with input from a 60W solar permanently on the roofrack. I chose the Projecta last year because it preferentially takes solar power first and tops up with alternator current. It has a good MPPT charger. It also has very good temperature regulation with a probe that you mount to the casing (or neg terminal) of the battery. The latter is essential for underbonnet installation, but probably not essential in the back of a van. With the new Tvan, you now have 120W solar on the roof. That extra solar changes the game because during the day you will always be putting amps into the batteries. And with the Projecta that is while you are driving as well as when stopped. You are therefore less reliant on the alternator to charge the Tvan battery. I can see no need for a 40A DC-DC charger even with 2 AGMs. I find with permanent solar on the roof you are not running the batteries down as far. A few smaller trips lined up. The trip to the Big Red Bash will be the longest one for this year. Yep water is usually the heaviest thing. The 108L tank would be plenty for most trips however it's handy to be able to carry some extra for when the water quality is not so good along the way. Haven't needed to carry extra fuel yet. The 150L tank on the Prado has been good enough so far but there are some trips we would like to do where fuel carrying would be necessary. We intend going back to a weighbridge when we are fully loaded up just to see where we end up. Hi Tim, just wondered if you have a photo of the 40amp charger, they failed to fit ours prior to pick up & have just had it done at the dealer. To be honest I'm not happy with how it looks. Thanks Tim, that is great & definitely proves how much they have stuffed ours up.